Ocean liners are the largest vehicles ever used for public travel. For example, The Michelangelo, the sistership of the one in the video, was as long as three football fields and weighed as about as much as 262 Jumbo Jets (747s). That many jets could carry could carry about 109,000 passengers, while the ship could carry only 1775. That left a lot of extra space for restaurants, casinos, and mechanical-horse exercise equipment (as you’ll see). Of course, liners couldn’t compete with jets. 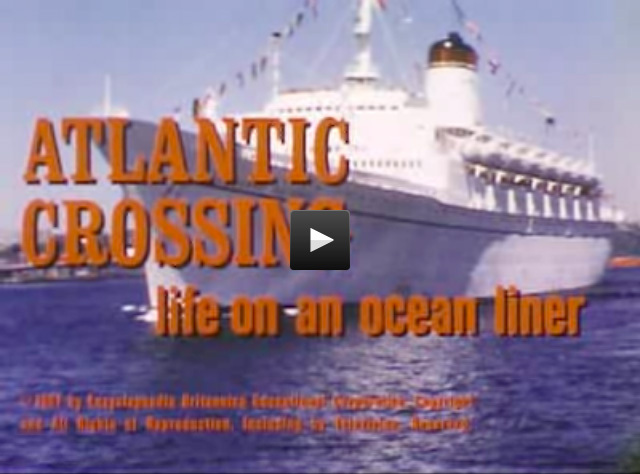 This film was made in 1967 as the ocean liner era was coming to an end. It looks like it was an amazing way to travel. Actually, you still can still travel that way, if you’d like. The QE2 QM2 makes the trip from New York to Southampton in seven days. Fares start at about $1,000/person for an inside stateroom.